Dr. Buesseler is a Senior Scientist at Woods Hole Oceanographic Institution in Woods Hole, Massachusetts. His research interests include studies on the fallout from atmospheric nuclear weapons testing, assessments of Chernobyl impacts on the Black Sea, and the examination of radionuclide contaminants in the Pacific resulting from the Fukushima nuclear power plants. He is leading the Radiation from Fukushima segment of research for The Longest Swim. When a tsunami flooded Japan’s Fukushima Dai-ichi Nuclear Power Plant in 2011 it initiated the largest accidental release of radioactive contaminants into the ocean in history. Scientists estimate that the majority of these contaminants moved offshore, where ocean currents diluted and transported them westward from Japan to North America. During his swim Ben will follow a similar track as these currents; using both a wearable “RadBand” cesium collector and conventional water sampling, The Longest Swim crew can provide a look at how far and how fast these particles are moving, as well as their concentration across the Pacific Ocean. We’ll be using two methods to detect cesium in the water: traditional filtration and the wearable RadBand device for Ben. Can you explain the differences between them? Remember, before Fukushima there were already radioactive forms of cesium in the ocean left over from nuclear weapons testing. To measure the small amounts we’re looking for we need about twenty liters of water and from that we need to extract cesium, remove it from other sources of radioactivity [like weapons testing], and purify it to the point that we can measure its radioactive decay in the lab. To do that we use a column of resin beads that are very selective for cesium – sort of like the clay these particles stick to on land – and very slowly pass the water through that, and the cesium will absorb in that column. We’ve done over 900 samples in five years using this method, which takes a lot of work and several hours per sample. So we thought why not take this resin, use it passively like a sponge, and stick it on someone’s ankle while they’re swimming. That’s the RadBand idea. 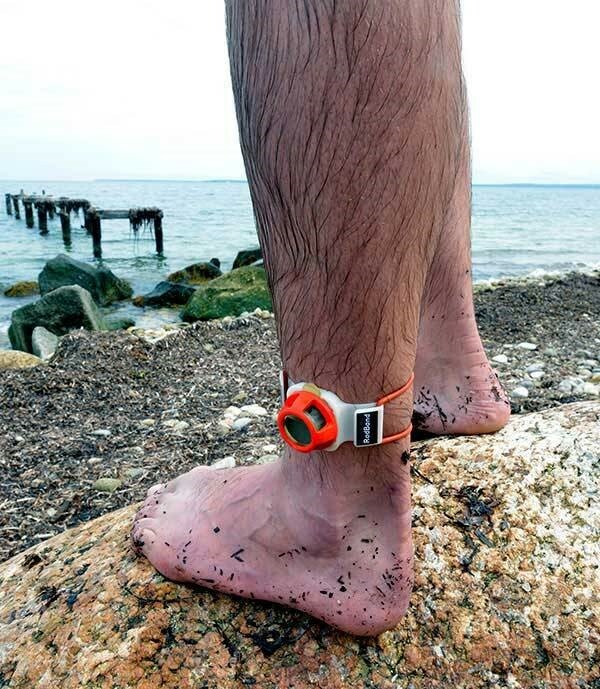 You take the same chemical materials – those little resin beads – expose them to seawater for several hours on someone’s leg, and that swimming action will allow the cesium to attach to the material on the ankle. How will you know how much water the swimmer “sampled”? We have a clever way to analyze not only the radioactive forms, but the stable form of cesium that’s a very constant number throughout the ocean per liter of water. So if I measure a certain number of micrograms of the stable form I’ll know that ankle band has seen a specific number of liters of water flushing through it. That allows me to take the radioactive amount we see and divide it by the volume to get a concentration. So even though we’re not measuring volume at the ankle band or how efficient it is, we don’t have to because we have this natural source of cesium that’s going to be our tracer. Is Ben going to be in any danger from these radioactive contaminants? The good news is that five years later the levels of cesium are hundreds of thousands of times lower than they were in 2011. The radioactivity levels on the West Coast, for example, are lower now than they were in the 1960’s when we were at the peak of fallout from the weapons testing that was being done in the atmosphere. We know there can be health effects from exposure to any amount of radiation, but our calculation that I like to report is that the highest level we’ve seen north of Hawaii is 10 Becquerels per cubic meter. Swimming through that for eight hours a day for an entire year could have possible health effects, but that additional dose is one thousand times smaller than a single dental X-ray. And what about radiation off the coast of Japan? The highest number I’ve seen off of Japan recently is 200 [Becquerels per cubic meter], which would be fifty times less than a dental X-ray. So you can swim off the coast of Japan, people do up and down the coast now. There’s still some concern about internalizing cesium by eating seafood, so seafood consumption is tightly regulated, but even that is opening up off Japan. They’ve gone from having half their fish above the legal limits for seafood safety down to one percent now over the last four years. Does that mean seafood from Japan is safe to eat? The seafood is getting better, they do a very good job. When I’m in Japan I eat seafood all the time because they monitor their food much more strictly than any other country in the world. What gets to market has a ten times stricter limit on the amount of cesium that’s allowed than in this country or in Europe. And now they are dumping radioactive tritium laced water into the Pacific Ocean. I wonder what else is in it that they are not telling us about. I mean it was the water they were spraying on the reactors while the meltdowns were happening. They seem like they are intentionally trying to kill the Pacific Ocean.